I listen to books. Like, a lot. Really. The ladies at the public library have a shelf just for me. 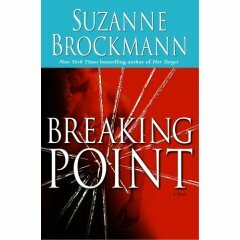 I just finished Breaking Point by Suzanne Brockmann. It was a real popcorn book. Spy adventure love story stuff. It was R-rated, so I wasn't that comfortable listening to it without headphones with my youngest child around. Although it was action, etc., it was still funny and I loved Patrick Lawlor's voice. Unfortunately, the library doesn't have too many more books that's he's read. There are several people with voices I love, and he just made my top 5 list. After a too busy week with too little sleep, I try to schedule a mental health day. I'll turn off the alarm clock and unplug the phones and spend a day doing whatever suits me best (as long as it doesn't involve working). Yesterday was my mental health day. Unfortunately, I forgot the 'unplug the phones' part, so my day started at 9 with a call from a dear friend. Good thing I really, really like her. After the call, I spend the rest of the day engaging in quilt therapy. A coverlet or blanket made of two layers of fabric with a layer of cotton, wool, feathers, or down in between, all stitched firmly together, usually in a decorative crisscross design. This quilt is from Eleanor Burns' Bear in the Woods quilt book, and I made the top yesterday (entirely from stash). I'm not sure my therapy is complete. 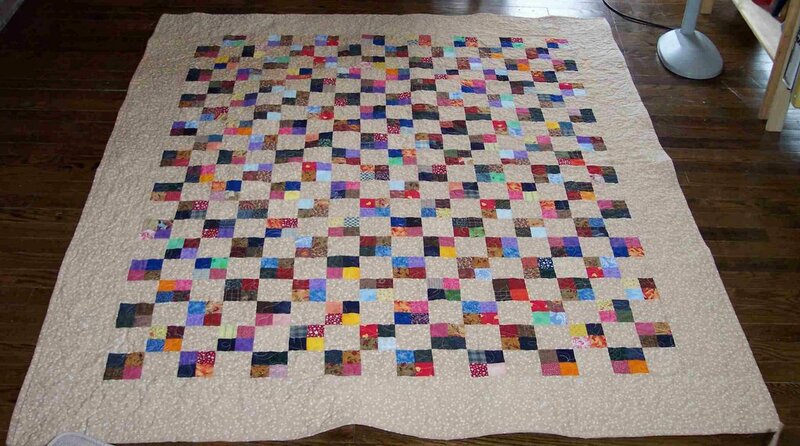 I may have to take more time off to quilt and bind this quilt. Please note, you have seen and will probably continue to see red/pink/white scrap quilts from me. Did I really buy all that fabric? Someone must have snuck it in my sewing room while I wasn't looking. A while back, I led a quilt group at my church. Ladies (and gentlemen!) 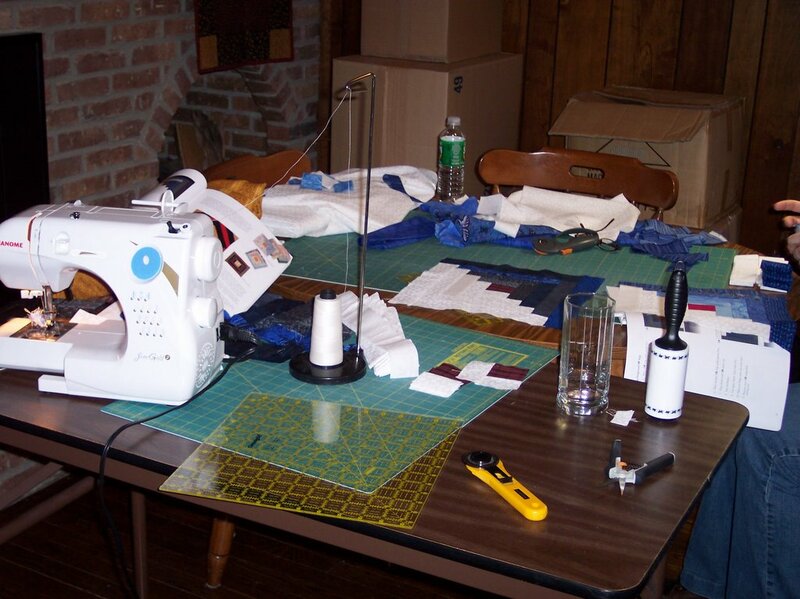 learned the basics of quilting while enjoying each other and making quilts to give away. After a year, it became too much for me to do alone and no one else stepped up, so it kind of ended. 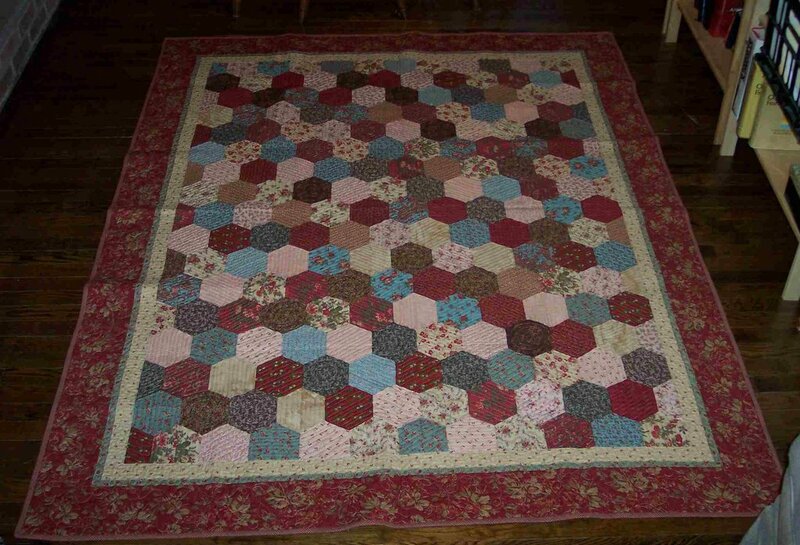 We finished several quilts and gave them away (some are in the Ukraine, even! ), but the rest of the partially done quilts make their home with me. This one only needed a binding, so I finished it. I'm not sure where it will go, but someone will definitely love it. Ding, dong, the witch of a week is dead. I'll try to catch up in several posts. 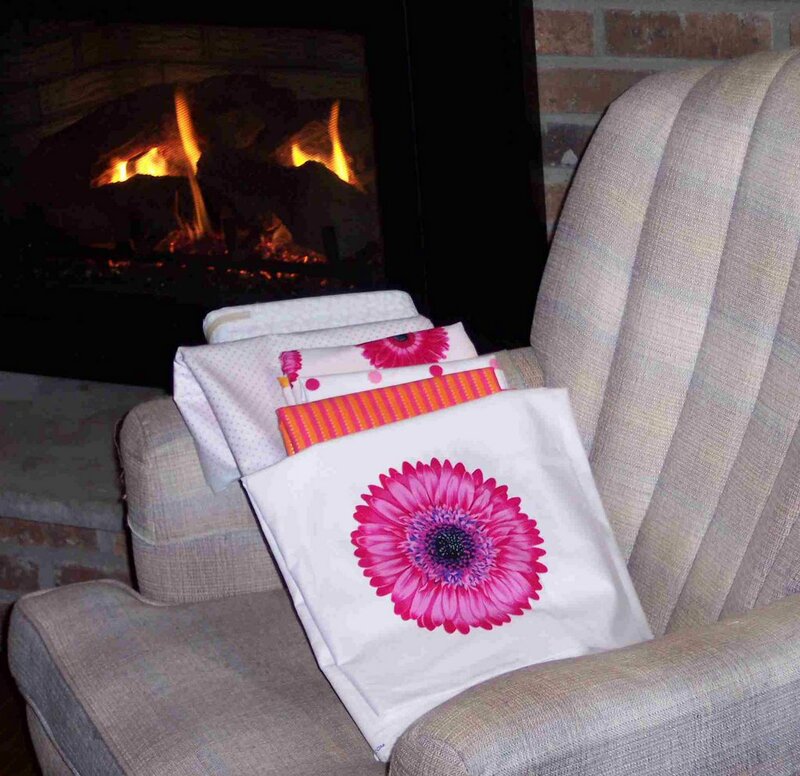 It was a shop sample with Lakehouse Fabrics. I must humbly admit to being not very creative at all, especially since I followed the designer's pattern for the quilt. The entire quilt is fussy cut so it took forever, but the fabric was so darn cute, I barely minded. I will try my hand at creativity, though, with the leftover scraps. We'll see what happens. I was teaching today, so no more customer quilts were completed. I did manage to finish binding a shop sample and the fabric is too darn cute. 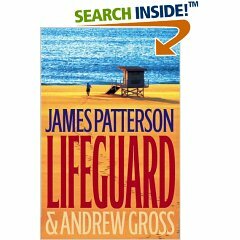 I finished listening to Lifeguard by James Patterson. Pretty close to a popcorn book. Now to find another one. I really liked that this was read by Billy Campbell. He was in Once and Again, Gods and Generals, and the crummy guy in Enough. He does a wonderful job with the different voices. I'm going to check the library and hope that he's done other books. Did you ever have a day when you just couldn't wake up? Well, it's 8:30 at night and I'm still waiting to wake up. I'm physically tired, but looking at the calendar for the next few days makes me even more exhausted. I finished a customer quilt today, with several more due too soon. Since I have so much quilting to do, I'll be able to post on books that I've listened to while working. 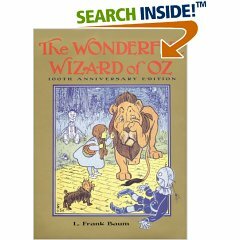 Due to an issue in the local schools, I was looking into books that have been banned. This one came up as one of the top banned books in the last 50 years. I finished listening to it today and cannot say that it's my favorite book. I wouldn't have banned it, but I wouldn't have had elementary school students read it, either. It has some interesting things to say. You know how mindless and fun movies are called 'popcorn movies'? In order to finish 7 more quilts by Tuesday while teaching and fulfilling other obligations, I need a good 'popcorn book'. Mindless fun that keeps me from noticing that I'm spending hours and hours standing at the machine. Suggestions? I have several books from the library in the house, and the 900+ I can download from the library. I'll try several and see what works. I was sitting in the car during my daughter's ridiculously long orthodontist appointment today thinking of all the things I have to do in the next week. Once I enjoyed a few moments of being ticked off, I gave up and just enjoyed my 2 hours in the car. I brought a quilt to bind and nearly finished the whole thing. I'll post a pic when it's completely done. 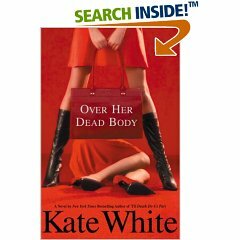 I finished listening to Over Her Dead Body by Kate White. The novel was OK. What was neat was that Lea Thompson read the book. Lea Thompson was the star of many of my 'date movies' with my husband. Tough to pick a favorite -- Back to the Future? Surely not Howard the Duck. Space Camp? I'll have to go with Some Kind of Wonderful. 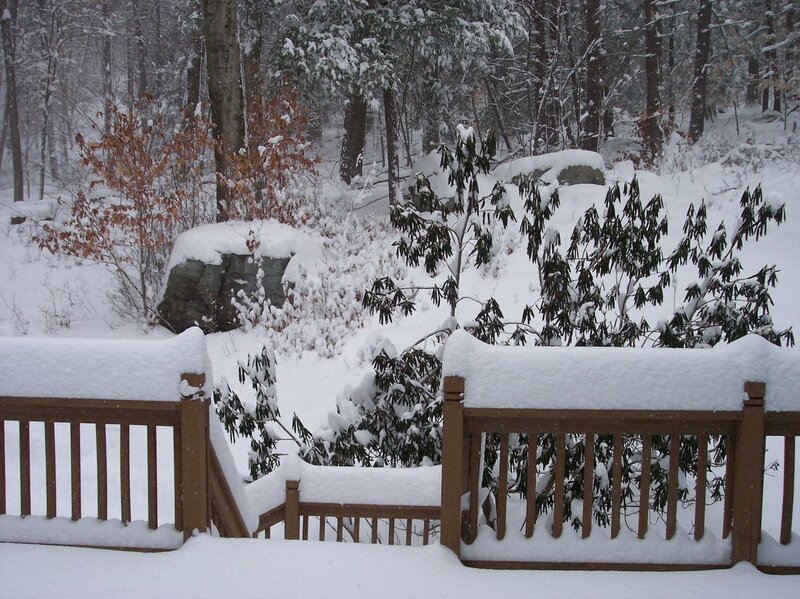 The next week will be light on postings. My husband's Event is tomorrow night. I'm teaching 2 days of longarming workshops. 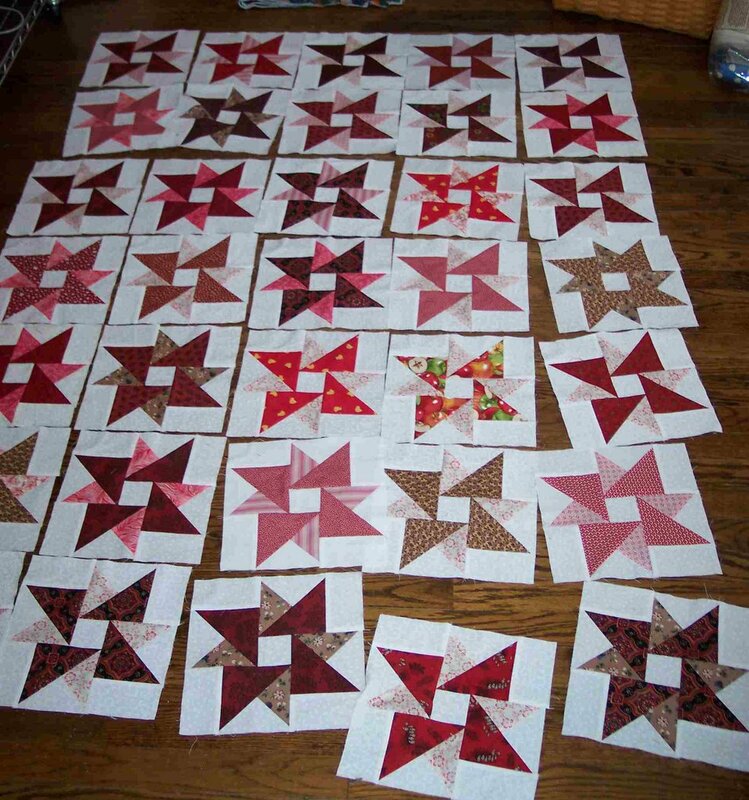 I have WAY too many customer quilts to get done by next week. And many, many more things to do in the next week or so. My new resolution: Stop Overcommitting Myself! 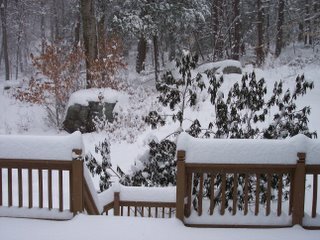 I love snowy days!!! Doesn't everyone? I told her I'd make her famous. She's not only beautiful and talented, but brilliant as well. This is what I do with my 2-inch scraps. I've made 6 or 7 over the years. 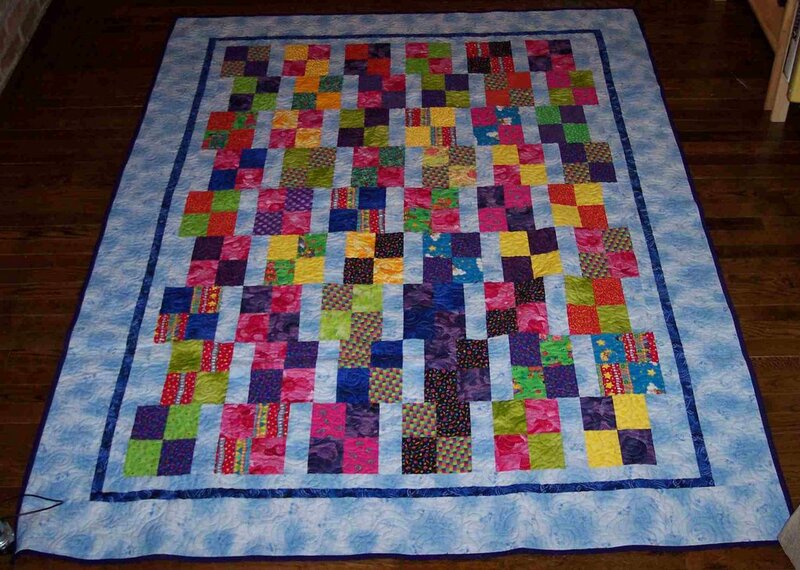 Most of the quilts have gone to my kids' friends for graduation presents and are all used and loved. This one will go in the graduation quilt pile. I finished the quilt and quilting in 2005, but didn't finish the hand binding until last night. The 2-inch scrap bucket is overflowing, so it's time to start another one, I guess. I just finished Point Blank by Catherine Coulter. I borrowed the unabridged CDs from the library. I enjoy 'thrillers' (as this book was tagged). This is the first of Ms. Coulter's books I've read and it was a great car book. It was obvious that there were other books in the series to fill in the alluded-to backstory, so I look forward to getting them from the library and letting them make my errands less painful. I live 6 miles from the closest gallon of milk, so any errand takes a bit of time. (We live at the beginning of nowhere -- I've been to the middle of nowhere and we're not even close!) This book was 10 hours long and I finished it in 3 days in the car? That's a glimpse into my life, I think. I thought taking yoga was good for me. 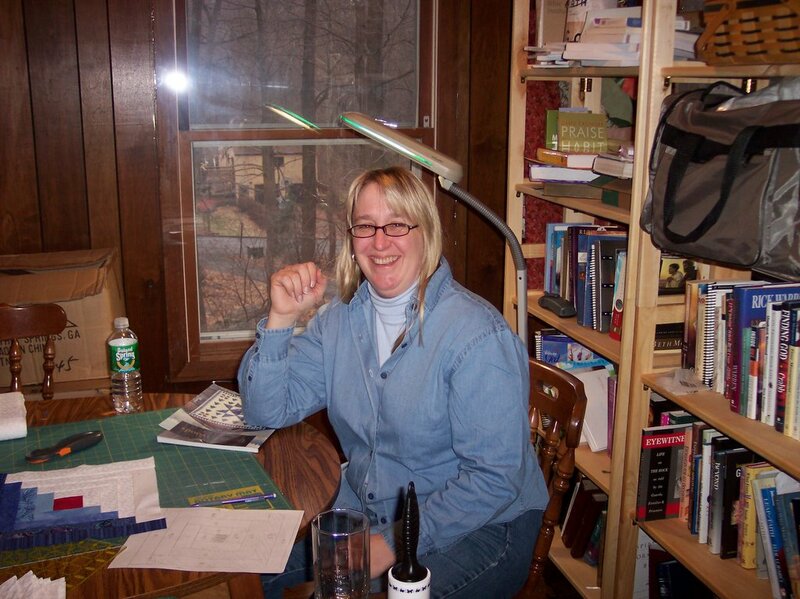 I was in a car accident 10 years ago and have been in near-constant pain from a back injury ever since. I've done the doctor and chiropractor and all sorts of exercises and stuff, but avoided medication and surgery. (I've also avoided losing the extra weight, but that's a whole other story). So my dear quilt friend started taking yoga and a few months later I joined her. My back pain went away within a week and I haven't had a problem since. It's only been 5 weeks or so, but I've been amazed at how wonderful NOT being in pain feels. See, the yoga studio is in the same plaza as our local quilt shop. It seemed like a good idea. I mean, I'm at the shop meeting customers all the time and would be more likely to go and do yoga if it was some place I already was, you know? So three times a week I'm at yoga, and three times a week I'm at the quilt shop. It would be rude not to stop in, right? Another entire bolt of white-on-white fabric and a yard of sale fabric. 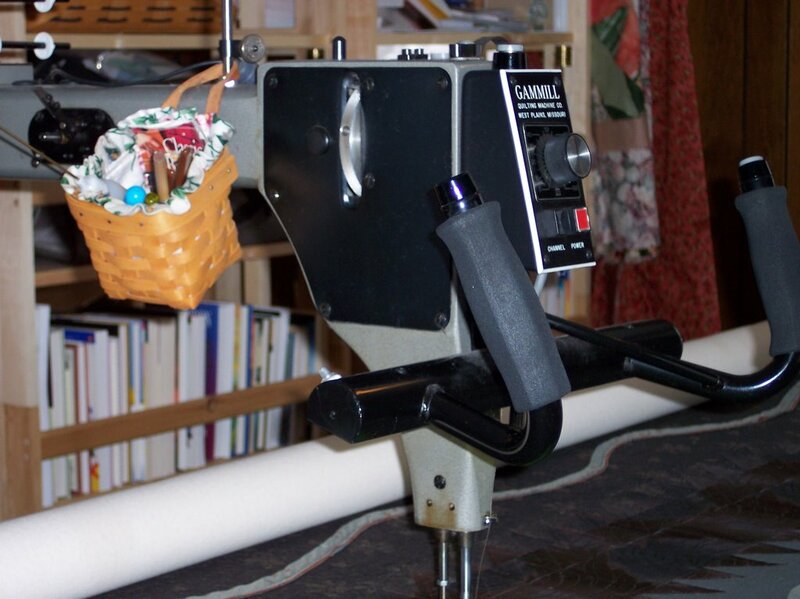 The 'only a yard of sale fabric' is thanks to Bonnie at Quiltville. I've been enjoying her site and decided that pieced backings are in my future. Otherwise, the 'one yard' would have been 'the rest of the bolt'. Babysteps, right? Still, my fabric will outlast my ability to use it all. Of this I am sure. Continuing my Tom Hanks movie run, I pulled Saving Private Ryan from the shelf (we have a dvd stash as large as my fabric stash!!!). Great movie. It's strange how you can see Matt Damon in Harrison Young, the actor who portrayed James Ryan as an older man. Excellent job of casting. I wonder if there are any more Tom Hanks movies on the shelf??? 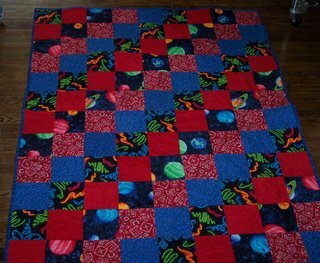 I've posted photos of new fabric, but none of completed quilts. These quilts represent what I've finished in 2006 so far. Hopefully many, many more completed quilt photos will be added to this blog in the near future. I have many, many UFOs to clear out. I finished these last night. I needed a runner for my dining room table. I made the other runner for my friend for her birthday/Valentine's Day. 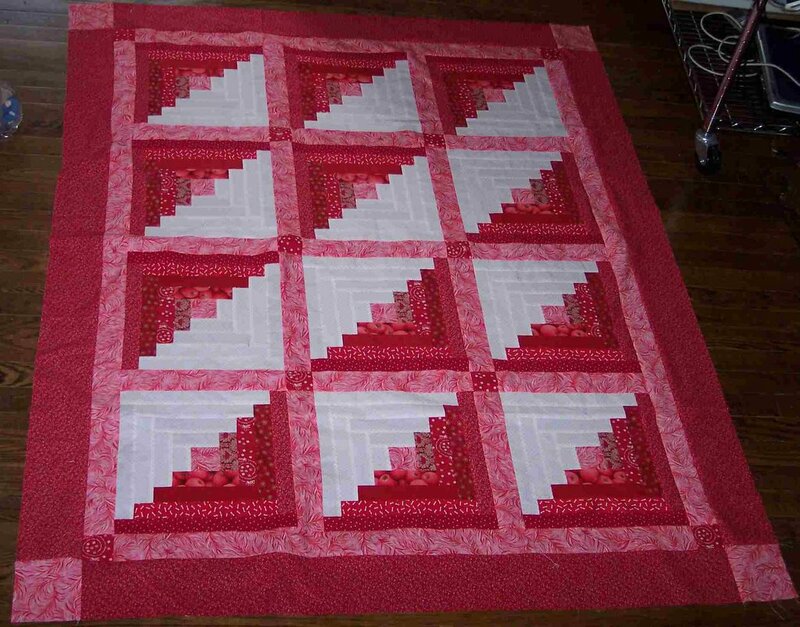 The block pattern is from Nickel Quilts and I just added some sashing and borders. They were entirely from stash. Yay! This is a fun quilt. 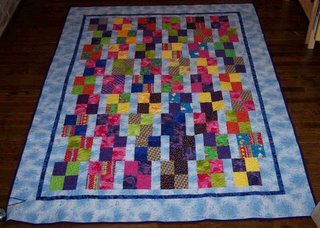 I made enough blocks from my 'brights' stash to make three quilts. I also found an entire bolt of sky blue in my stash that was a great background. Yards and yards of fabric used! I purchased the three backs from the sale rack at my local quilt shop. (LOVE sale racks! -- maybe that's why my stash is so huge?) I gave the first quilt to my son's girlfriend for Christmas and she loved it. This is the second done and it will eventually go to someone. Maybe a graduation quilt? 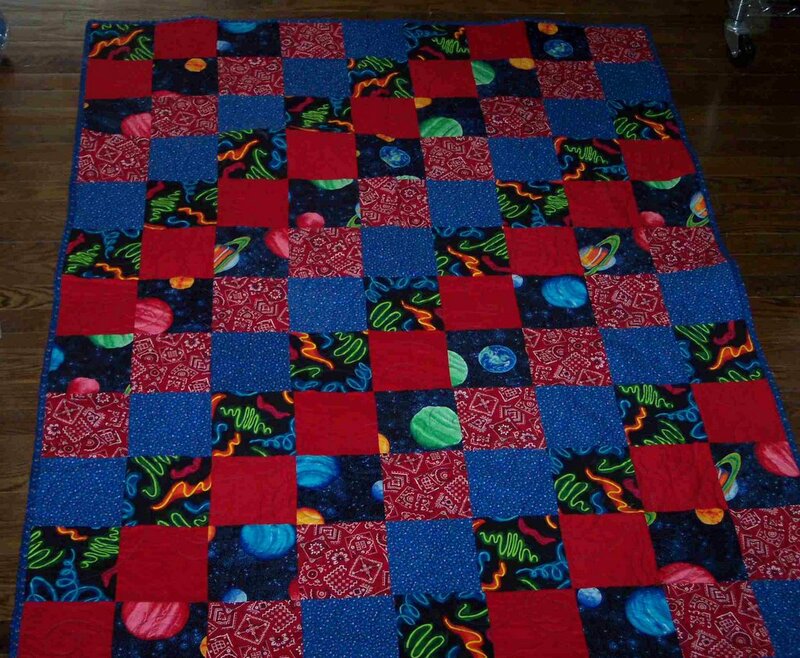 The third quilt in the series is still in the UFO pile. The pattern is from McCall's Quilting Magazine April 2004, I think. 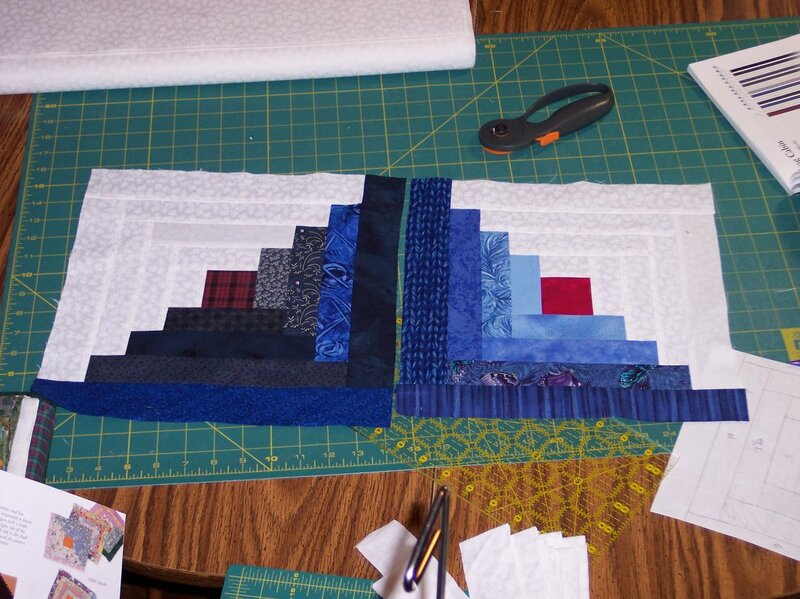 This is the first Moda University quilt. I signed up for the club at my local quilt shop. Isn't it fun hanging out with other quilters? Every month we make a block and get a quilt pattern. I normall don't do kits, but I've purchased all of them so far. 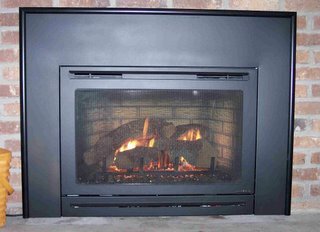 This is the first one finished. I think it's called Hexagon Magic and it was incredibly fun to make. The hexagons are not actually hexagons. They are rows of trapezoids (?) sewn together. No yucky inset seams or anything. 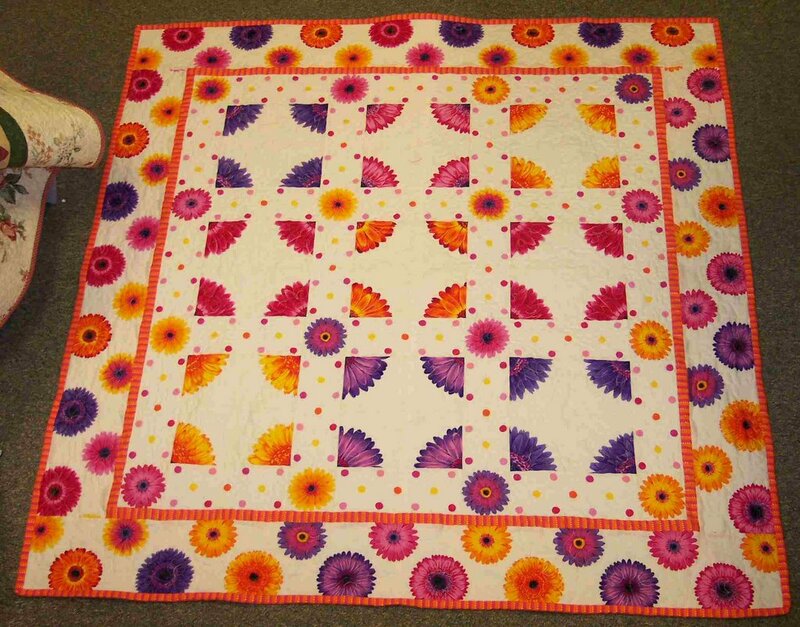 I was going to give this quilt away, but I've fallen in love with it and will keep it as a coverlet for my bed. I'm not sure if the trend is noticeable or anything, but I don't make difficult quilts. I work as a quilter, so I tend to make simple quilts for myself. I'd like to finish them in this lifetime. The more difficult quilts I've started are buried deep in the UFO pile. This blog has been a great motivation for me. I have to finish binding another quilt so I can post another picture! Last week when I was donating platelets, the people at the blood bank were playing Forrest Gump. I was lying under the television set, so I couldn't actually see the movie, but simply listening to it reminded me what a great movie it was. I watched it a few days ago and fell it love with it all over again. "So I went to the White House, AGAIN..."
Since I enjoyed a Tom Hanks movie so much, I thought I'd watch another one. Last night I watched The Money Pit. My husband watched this movie while we were dating and it was hysterical then. Four years ago we bought our first home. It's a great house, but a bit of a fixer-upper. Watching The Money Pit. 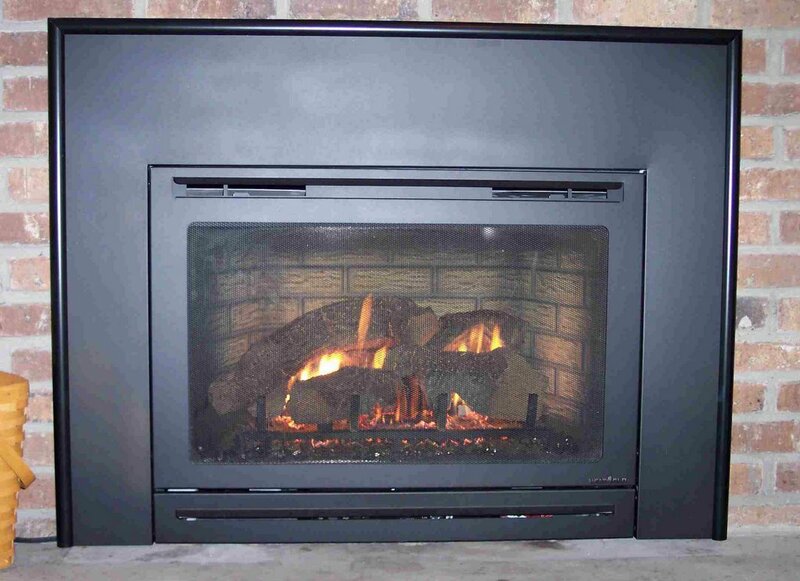 again after living through a few fiascos (ceiling collapse, leaking roof, broken pipes, etc.) made the movie even funnier. We haven't had the bathtub fall through the floor yet, or the stairs completely collapse, but the week is still young. What Tom Hanks movie to watch next? HELP -- I'm losing ground! This is the new Lakehouse fabric for a sample for my local quilt store. And behind the cut fabric is an entire bolt of white fabric! My friend and I are making Eleanor Burns' Bear in the Woods quilts (other than the background, it uses ALL STASH!) and we each need 7 yards of white background. Unfortunately, I ordered the bolt thinking it held 15 yards and it's only 10. So, soon there will be another acquistion picture showing another entire bolt of white fabric. 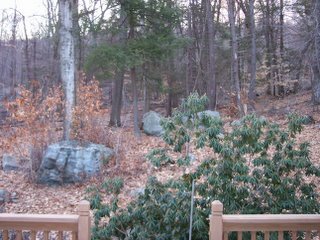 Wow, I'm going to have to show some pictures of work completed in 2006 to balance out the acquisition photos. Soon, very soon. Today was the haircut. I woke up with a bob and I'll go to sleep with a flip. Aren't haircuts grand? I recently downloaded Hellfire from the library and listened to it this morning. Diana Gabaldon's Outlander series is my guilty pleasure. How could you NOT love Scottish Highland romantic fiction when coupled with time-travel? I mean, really, what's not to love? Hellfire was a novella about Lord John Gray. It was very short but very enjoyable. My darling husband is receiving an award at an Event. There are events and then there are Events. Little 'e' events are nice places to go. Big 'E' Events are places you go that take a month to prepare for. This is one of the latter. 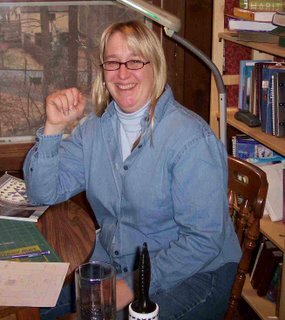 Last week my dear quilting friend went shopping with me and helped me pick out a dress. I'm a sweater, jeans and boots type of gal, so a dress is something foreign. Shopping for a dress for an Event requires sedatives. We persevered and I'm quite pleased with the dress. I was thrilled to be done with stage one of shopping for the Event. Today was stage two: drive a distance to the fancy shopping mall and work on purchasing accessories. After three hours of solo shopping, I couldn't take any more and fled home. Fortunately, I had made some purchases. A lovely Ralph Lauren silk wrap and some very cute Steve Madden shoes. I'll see dear quilting friend tomorrow for her approval, but I'm quite proud of the purchases and am confident she will be in favor of my keeping them. Many thanks to the darling daughter whose lovely arm is in the photo. This is as close to a dress as she intends to get. There are many stages of preparing for the Event left to enjoy: the hair cut, the purchasing of the bag, the selecting of the makeup, and the selecting of the jewelry. I need some time to recover before I move to stage three. Quilt therapy? Do husbands know what Events do to wives? I think not. Not too much sewing between church and the Superbowl party, but I managed to sneak in a hostess gift for the dear friends who invited us to watch the game. Down-and-dirty potholders. 45 minutes, I think. 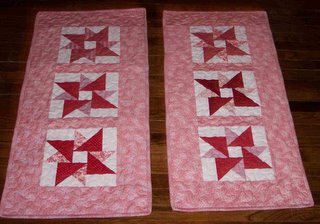 The blocks are from Nickel Quilts and I backed them with Sandcastle Cloth and used Thermolan batting. No quilting. No binding. A simple stitch and flip. I haven't done that in a while, but the time constraints of the day allowed for nothing else. All materials were taken from my stash. This small amount of fabric doesn't counter the acquisition of 40 new fat quarters, but I feel noble, none the less. The black-and-gold potholders got the job done, though. The Steelers definitely did NOT play their best game ever, and I'll allow that one touchdown may have been questionable (not reversible, but questionable), but the Steelers finally got one for the thumb. It's not the same here in New York as it was when we lived in Pittsburgh, but we definitely enjoyed some Pittsburgh nostalgia and enjoyed rooting our team on to eventual victory. Favorite player: tough one, but I'll agree with the Hines Ward MVP. The Bus is the heart of the team and a close second. Favorite play: Randle El throwing the touchdown pass to Ward. Amazing. Could watch it again and again and again. Favorite commercial: very tough one, but the Sprint(?) phone commercial with the built in crime deterrent. Excellent. Favorite part of today: watching a Steeler game with Steeler friends. And winning a Superbowl after 25 long years. I love my local library. They have a shelf behind the counter reserved for my family. We all go online and order books, CDs, books on tape, and DVDs from the library system and they magically go to our local library and wait for us to come and get them. We started doing this a few years ago and I thought the library had reached the ultimate in coolness then. Now, I can sign on the library website and actually download books to my MP3 player. For free. Instantly. At midnight if I want to. I discovered this only a few days ago. 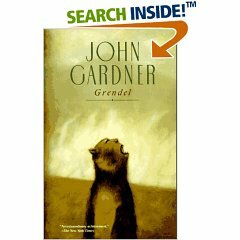 So far, I have listened to Grendel by John Gardner and The Wizard of Oz by L. Frank Baum. Both wonderful books, by the way, although quite different. I am a longarm quilter and listen to a lot of audio books while I work. 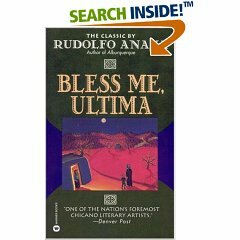 There are 957 unabridged books online and I look forward to listening to them all. Ask if your local library offers similar services. Superbowl Sale at the Quilt Basket! 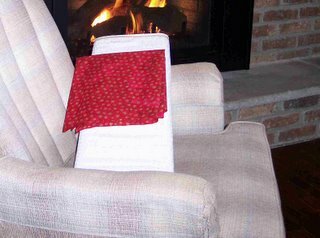 OK, so the Quilt Basket has a Superbowl Sale this weekend. Since it's the 40th Superbowl, 40 fat quarters are $50. So, my goal of stash depletion is further away today than yesterday. 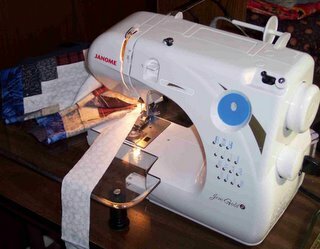 I'll have to sew all afternoon to try and recover.